I am not sure where November went...but wow it flew by! If you missed anything on Silhouette School - and we were jam packed with Silhouette tutorials, tips, tricks and free designs - we've got ya covered! Like we do every month I'm sharing a wrap up of everything we covered. 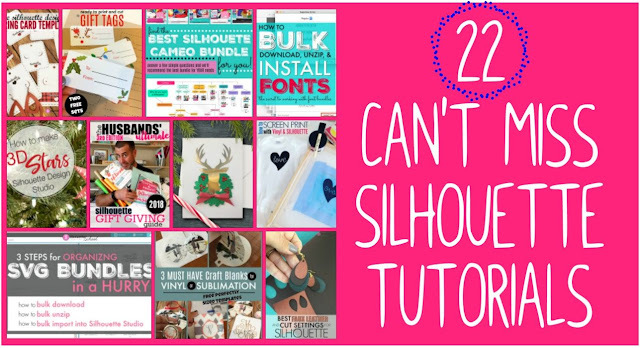 So here are the 22 Silhouette Cameo tips, tricks, helpful hints, free Silhouette designs and more that were shared in November! - Computer Requirements to Run Silhouette Studio: Will a Tablet, Chrome Book Book or Phone Work? - How to Roll Paper Flowers with a Drill Tutorial! - 2018 Silhouette Black Friday Deals! - Best Silhouette Cameo Bundles Comparison: Buying Help! - LIMITED TIME Black Friday Sale: Save on Silhouette U, Silhouette School EBooks, and SoFontsy Sitewide!